Faces of Concern: Dorothy Fadiman's trilogy of films about abortion show this weekend in Palo Alto. THE YOUNG Stanford student Dorothy Fadiman was in an unthinkable situation. She had become pregnant. Since abortion was still illegal in California in 1962, she paid $600 to a person whose face she never saw (she was blindfolded throughout the operation). Shortly afterward, she began bleeding and ended up in the hospital with a fever of 105. She could have died, like so many women who perished from septic amateur abortions. In later years, after Fadiman became a filmmaker, she decided to go public about what happened to her. She has gathered the story in her trilogy From the Back Alleys to the Supreme Court and Beyond. The Dorothy Fadiman Film Festival celebrates the Palo Alto-based documentary maker, and the 25th anniversary of her company, Concentric Media. A person who made documentaries told me once that the process of making them is like taking a suitcase full of money to a high place and dumping it over the edge. Yet Fadiman has successfully continued in the field, specializing in the subject of women's choice, family planning and the rise of AIDS. Her work has been shown on KTEH and elsewhere, taking in everything from the spiritual (Moment by Moment: The Healing Journey of Molly Hale) to the whimsical (Fix-It Shops: An Endangered Species). The two-day festival at Spangenberg Theater in Palo Alto is broken down into a series of programs costing only a dollar each. The 10am-noon show on Saturday features From Danger to Dignity: The Fight for Safe Abortion, followed by The Fragile Promise of Choice: Abortion in the United States Today. The picture facing those seeking abortion is better than it was in Fadiman's youth, but the pressure against abortion providers continues, as the filmmaker mentions in her notes to this film: "The murders, bombings and arsons escalate. Funding for low-income women virtually disappears, waiting periods increase, the number of states with parental consent grows and clinic demonstrations continue to attempt to deter women. We decide to document the onslaught against abortion providers and women who seek their services." 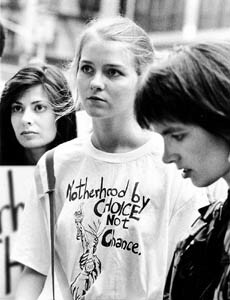 At 12:45pm, Fadiman's story--and others--is revealed in the Oscar-nominated 1992 short documentary When Abortion Was Illegal: Untold Stories. It's followed by Fadiman's Woman by Woman: New Hope for the Villages of India and Seeds of Hope: Meeting the Challenges of HIV/AIDS in Ethiopia. Sunday's program is a series of documentaries moving away from the problems and into the realm of solutions: Radiance: The Experience of Light, Peace: A Conscious Choice and Moment by Moment: The Healing Journey of Molly Hale. Hale is a Menlo Park woman who dislocated her spine between the sixth and seventh vertebrae; the doctors felt it was most likely she would never walk again, but Hale--through both Western and Eastern medicine--regained enough strength even to get back to her aikido classes. It is an inspiring story. Molly and her husband and caretaker, Jeremy, give a true demonstration of the power of the human will. The Dorothy Fadiman Film Festival plays Nov. 8-9, 10am-5pm, at Spangenberg Theater, Gunn High School, 780 Arastradero Rd., Palo Alto. Tickets are $1 per program. Call 650.568.4340 or check www.concentric.org/anniversary for details. From the November 6-12, 2003 issue of Metro, Silicon Valley's Weekly Newspaper.